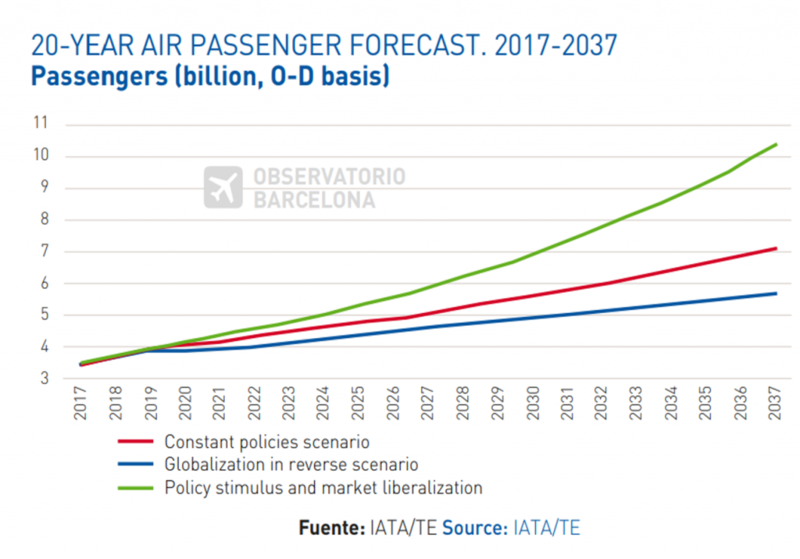 IATA forecasts that the number of passengers will double in the next 20 years. Thus, in 2037 they estimate 8,200 million air passengers, representing an average annual growth rate of 3.5%. However, they warn that this growth forecast and the economic benefits driven by the sector could suffer due to changes in the future economic evolution (GDP and international trade might be affected by the implementation of protectionist measures and the rise in oil prices, among other factors). IATA also forecasts a geographical reorganization of global air traffic. Asia-Pacific will lead growth with more than half of all new passengers in the next 20 years, displacing the USA to the second place in number of passengers in favour of China, and the Spanish market from the fourth to the sixth place, overcome by India and Indonesia. Barcelona firmly consolidates itself as the seventh European airport in terms of passenger volume in the accumulated period January-September 2018. The airport increases its advantage with its direct competitors (London Gatwick, Munich and Rome Fiumicino), growing more than them in this period. There is no variation in the top 10 European airports ranking in terms of passengers. From these 10 main airports, Frankfurt, Madrid and Istanbul (+8.4%) recorded the biggest growth. Barcelona recorded the fourth highest growth (+5.4%), three percentage points less than in the same period of 2017 (+8.3%). In traffic origin and destination, Barcelona continues as the fifth European city, just behind London, Paris, Istanbul and Moscow. Vueling leads the growth in the seat supply in the Barcelona European market, ooffering more than 2.2 million extra seats until September (+14.1%), thus consolidating its strategy of controlling the capacity of Barcelona airport. It is followed, at a long distance, by Ryanair also with a significant increase in seats, by 8.4% (+475 thousand). Although in the short term it does not seem that it can aspire to a market share similar to Vueling. Next, Eurowings, TAP and Wizz Air and Aeroflot, which lead the relative growth of passengers in the analysed period. On the contrary, Monarch Airlines, Air Berlin and Germanwings reduce a 100% of their capacity, due to terminations and takeovers of these companies during the year 2017. Barcelona continues to be the main Spanish gateway for entry and exit traffic to and from Asia, Africa and the Middle East above Madrid and the rest of Spain within the period January-September 2018. However, for the markets with the highest passenger traffic, South America and North America, Madrid is still the main origin or destination. The number of O&D intercontinental passengers has increased by 10.2% (and at an annual average rate of 9.4% since 2010), thanks to the increase of passengers on direct flights. Intercontinental passengers on direct flights represent 40% and have increased by almost half a million people compared to the same period of the previous year (+25.5%), due to the increase in routes and capacity on direct flights. In contrast, passengers on non-direct flights grow very moderately (+1.7%). • Barcelona gains market share in North America, South America and Africa, growing above the Spanish average. The growth of passengers entering or leaving North America stands out (+ 17.1%), due mainly to the new Norwegian and LEVEL routes, thus increasing capacity and frequencies. Latin America market continues to grow significantly with the LATAM Airlines and LEVEL bet. There is also an increase in market share to Africa, where Barcelona represents almost 35% of the Spanish origin and destination passengers.